Fabric: Stitched on 28 count Earth hand-dyed linen by Crossed Wing Collection (715-258-5915). Materials Summary: A total of 25 Weeks Dye Works colors used in model. Design is stitched almost entirely with Weeks Dye Works floss in full cross-stitches. 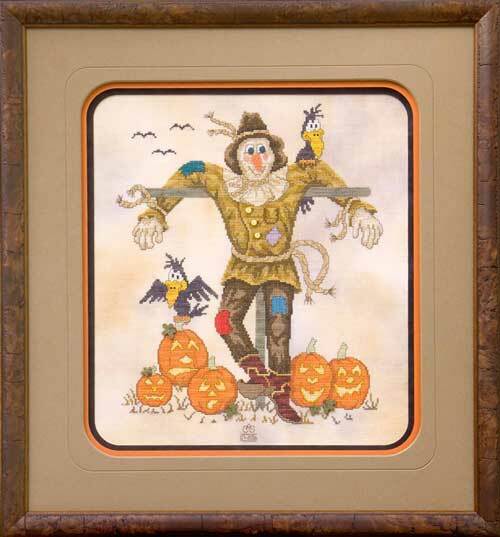 Quarter stitches only appear sparingly in the face of the scarecrow and crow’s beaks. One color of Wildflowers™ from the Caron Collection is used for the grassy area below the pumpkins. Pattern requires embellishments from Just Another Button Company, www.justanotherbuttoncompany.com.